When I think that the author started working on the idea for this story in 1967 - I am totally in shock! This guy was WAY before his time. This is a total mind warping book. Basically, the story is about the probable invasion of aliens and their elimination. Where three Wiggin's children were tested and all sent for battle school (Peter, Valentine, and Andrew) evaluation. (They are all three absolutely crazy - IMO) The Wiggin's 'third' kid Ender turns out to be the best candidate for war. Ender gets sent to space and trained to save the world. While his brother and sister stay on Earth working the 'nets' - manipulating the general population's opinion of a cival war back home; but meant to have Peter come into full power on Earth. Ender saves EARTH. Peter rules Earth. Valentine and Ender ride off into the sunset. End of Story. 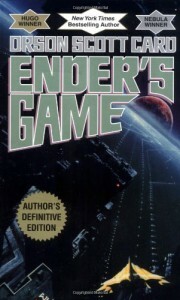 Okay, HOW Ender gets to check mate is where the genius comes in...online gaming, blogging propaganda, etc. Unbelievable. I totally didn't see the reveal coming. I like it when I am fooled.